LTO-6 tape cartridge. With a record-low cost, LTO tape translates to just roughly .8 cents per gigabyte. Cloud solutions are cost and capacity-prohibitive, argue LTO Program Representatives Shawn Brume (IBM); Terry Cochran (Quantum) and Laura Loredo (HP). Storage has long been a topic of discussion and debate in the media world, and as the volume of data in entertainment increases, so does the importance of the creation, management and delivery of digital content on a global level. Some argue that cloud-based storage services are the ultimate solution to the expanding base of content coming from industries that produce electronic media. However, this isn’t necessarily true – cloud solutions are in fact notorious for being cost and capacity-prohibitive in many cases, not to mention vulnerable. Data managers evaluating potential solutions for more secure, long-term data storage aren’t always educated on all the options available. 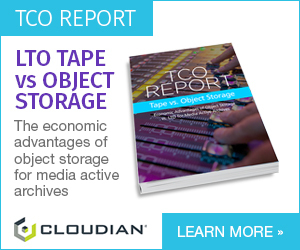 With the current focus on disk and cloud-based backup technologies, many don’t even consider tape storage, even though tape has the cost, capacity and security measures to meet the needs of today’s media businesses. A primary question data managers must answer is how long organizations plan on keeping data, and how often they will need to access it. Typically, the longer you seek to keep data, the more tape becomes a perfect storage solution. In addition, a tape drive or tape library is infinitely scalable – making it a great option for those looking to store large, and growing, amounts of video footage or similar media. According to Coughlin Associates, the required digital storage capacity used in the entertainment industry alone is expected to increase by more than 500 percent between 2013 and 2018. This explosion of storage capacity means those responsible for preserving content are finding a need to reevaluate the safety and manageability of their systems. LTO Technology offers its customers in electronic media and entertainment an easy, reliable and cost-effective way to meet these storage capacity demands while increasing operations, efficiencies and security. Not to be ignored, cost is always a barrier to overcome when implementing new processes or systems. With a record-low cost, LTO tape translates to just roughly .8 cents per gigabyte. And with a compressed capacity of up to 6.25TB, this makes LTO technology the most cost-effective storage option on the market today. LTO technology also offers customers a reliable, and portable, medium for offline storage, and also utilizes LTFS – a method of accessing tape files that function much like accessing disk or memory stick files. This system combats the myth that tape storage is only appropriate for archival purposes, storing a mass of cold data never again used by the organization. In reality, tape can function as an active archive, storing media for easy and rapid access. As content continues to expand, so does LTO’s technology and capabilities. Tape innovation is an ongoing effort, and with successive generations consistently producing larger capacities, LTO tape is keeping up with today’s technology and enterprise demand by providing solutions that can accommodate the staggering amount of content created in today’s world of electronic media and entertainment.